San Antonio Skyline Twilight – This is our latest San Antonio Skyline Twilight image we took from a good distance from the downtown actually over 6 miles. San Antonio is a difficult place to get good skyline pictures but I think this one did the job. 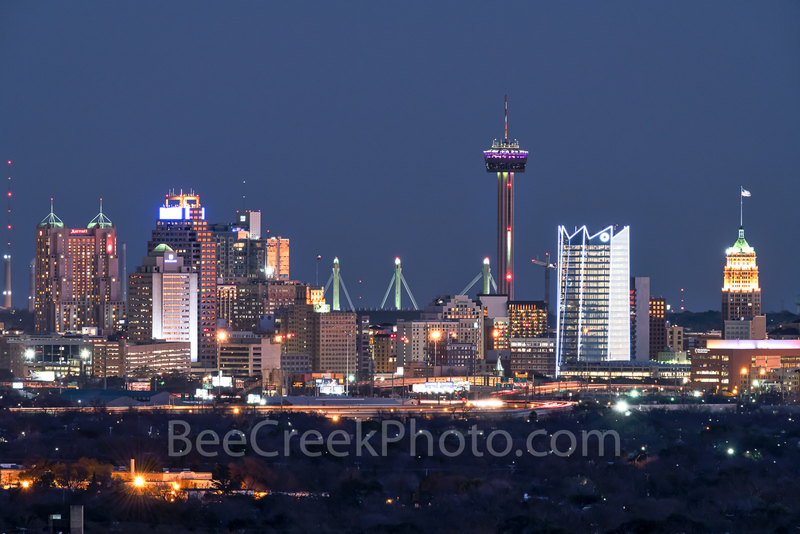 This San Antonio skyline has the new Frost Tower in which is the latest edition to the city plus this picture also has other city landmarks like the tallest building the Tower of Americas at 750 feet, the Life tower the first skyscraper at 404 feet, the Marriott Hotel, and the many other high-rise buildings many with colorful lights on them in the skyline. San Antonio is the second most populated city in Texas it is located in central texas on the edge of the texas hill country. Many tourist come here to visit the Alamo, or to visit the lively riverwalk not to mention the mission park through out the city. This image is also available in a panorama. San Antonio Skyline Twilight – San Antonio Skyline twilight image we took from a good distance from the downtown. We try and take different angles of the city so you can find the perfect view. This San Antonio skyline has the new Frost Tower along with all the other city landmarks like the tallest building Tower of Americas, the Life tower, the marriort, and the many building with the colorful lights on them. San Antonio is the second most populated city in Texas it is located in central texas on the edge of the hill country. Many tourist come here to visit the Alamo, or to visit the lively riverwalk not to mention the mission park through out the city. Posted in Travels and tagged Alamo, Frost, Frost Tower, images of san antonio, landmarks, Life Tower, mission parks, night, pictures of san antonio, Riverwalk, San Antonio, san antonio pictures, San Antonio Skyline Night, san antonio skyline twilight, skyline, texas, Texas Hill Country, texas pictures, tourist, Tower of Americas, travel pictures, twilight on January 22, 2019 January 22, 2019 by Bee Creek Photo. This Dallas vintage Pegasus show a close up with the Reunion Tower in the background as it appears to hoover over the city. The vintage Pegasus and the Reunion Tower are both official lankmarks for the city of Dallas and a toursit destination of things to see. Many come downtown to see these two iconic structures. The Vintage Pegasus has stood on top of the Magnolia Petroleum Building or Magnolia hotel since 1934 till 1999 when it came down due to damage over the years and and was replaced with a new flying horse which sits on top of the Magnoila Hotel today. It seem fitting to display the Pegasus as a Vintage Pegasus since this landmark has been around for a very long time. However in 2011 a group of Dallas artist and entreprenuers reconditioned the orginal flying horse back to life and it was place on an oil derrick in front of the Omni Hotel in downtown Dallas. Dallas pegasus have been a sense of pride for the people living here especially in the early 1940’s through 1999 as it came to be a become that you were home once you saw it. When the Magnolia was built it was the tallest building in Dallas so you could see the Pegasus from quite a distance. Now we have two Dallas Pegasos flying high over the Dallas skyline. The whole story of the pegasus came from greek mythology. Vintage Pegasus with Reunion Tower – This Dallas vintage Pegasus show a close up with the Reunion Tower in the background as it appears to hoover over the city. The Pegasus and the Reunion Tower are both official lankmarks for the city of Dallas and a toursit destination of things to see. Many come downtown to see these two iconic structures. 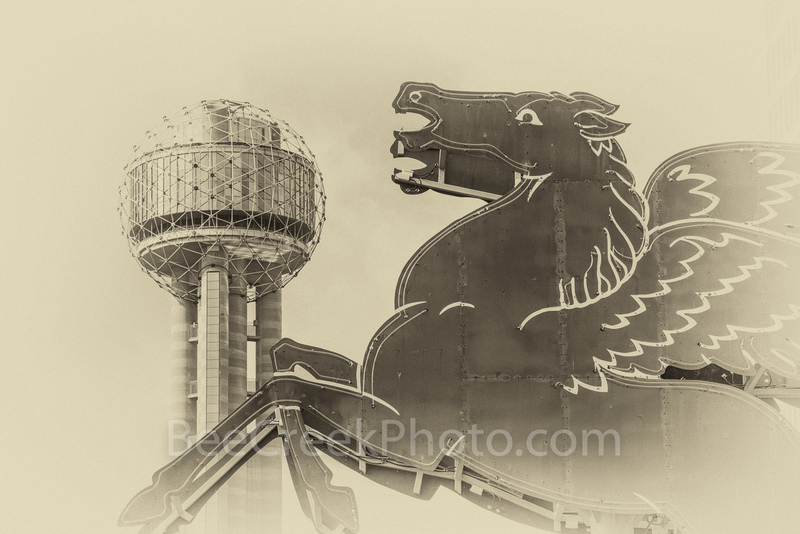 Posted in Photo of the Day and tagged city, Dallas, Dallas Pegasus with Reunion Tower, Dallas skyline stock photos, dallas stock photos, downtown, flying horse, greek mythology, iconic, landmarks, Magnolia Hotel, oil derrick, Pegasus, Reunion Tower, sepia, tallest building, two pegasos, vintage, vintage photos on December 22, 2017 September 25, 2018 by Bee Creek Photo.